The performance of the strategy since website inception is as follows. The model is underperforming US equities, but periods of underperformance will occur and this isn’t something to fret over. The cost of significant outperformance over the long term is that sometimes we must endure (sometimes significant) underperformance in the short term. Inability to endure periods of underperformance in fundamentally sound strategies is one of the reasons that dollar-weighted returns in the mutual fund industry are so bad. Investors herd into strategies after a couple years of relative outperformance. The pendulum swings the other way, and investors have a hard time sticking with the strategy during the underperforming times. No strategy can outperform at all times. We wrote an extended piece on tough (relative) times just over a year ago; you can read it HERE. As per the Alpha Momentum Strategy: The long term trend of the US stock market is down, while the short term trend is up. As such, half of the portfolio will be invested in stocks, with the balance in cash/equivalents. We will execute trades such that the model portfolio reflects the following composition as of close of trade on 2/19/19. Both the intermediate and long term trends of US stocks are lower. As such, the portfolio will remain 100% in cash/equivalents (no stock market exposure). We will check the markets again mid-month and update the portfolio if necessary. Both the intermediate and long term trends of US stocks are lower. As such, the portfolio will remain 100% in cash/equivalents (no stock market exposure). Commentary: It was a tumultuous time to be invested in US stocks in the 4th quarter of 2018 – domestic equities saw some real volatile price action! With moves in indices as aggressive as they were, most medium term traders who followed their daily PnL likely experienced several instances of feeling like a hero relative to the indices one day, and a zero the next (assuming a non-trivial degree of active share, of course). Volatility in stock prices can cause stress on investors and traders, and it is in times of stress when investors and traders often make their worst decisions. It is partially for this reason that systematic trading and investing confers an edge for those who are willing to pursue it. By relying on systems that have been well researched and tested, that have demonstrated edge, and those that are robust and evidence based, a trader or investor is able bypass the effects of this stress on their trading process. So long as the trader doesn’t override his system or make a careless mistake, the elevated stress that the trader feels makes absolutely no difference whatsoever on the investments in his accounts. By circumventing this “emotional trap”, systematic traders gain a meaningful edge over the narrative driven mainstream trading community. Side note: See the article at the link below. This is a good piece by Corey Hoffstein on robusticity with regard to a systematic dual momentum approach (as outlined by Gary Antonacci). The Alpha Momentum Strategy, outlined on this website, “borrows” several concepts from Antonacci’s work (among others’). Hoffstein points to the massive dispersion in performance that can occur between different parameterizations of the same system (e.g. use a 200 day moving average for one iteration, and a 150 day moving average for another iteration). This is precisely why we rebalance more than once per month and use several different parameterizations in our models - to (attempt to) avoid getting unlucky and ending up with the worst iterations in real time trading. We have written about this before on our blog (see that article HERE), and Hoffstein does a great job of covering this topic from another angle. See Hoffstein’s piece HERE. Here’s to a prosperous, happy and healthy New Year…thanks for following along! We will be making no changes to the portfolio for this rebalance. Recall that, as of 12/3, half the portfolio was invested and half the portfolio was in cash/equivalents. While we never like to lose money, the fact that we have been only half invested throughout December has kept losses relatively contained. 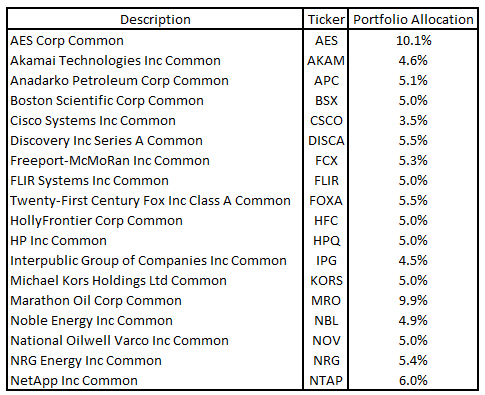 With the S&P 500 -7.8% for the month, the Alpha Momentum Portfolio is -3.5% on the month. Drawdowns happen even to good trading strategies. Having a strategy that is rooted in evidence-based analysis, is robust, and is quantitative (no guesswork or predictions needed), makes sticking with the strategy and making good decisions in difficult times easier. While the talking heads on TV banter back and forth about what the future will bring, we just run our system and let the cards fall where they may - over the long term, we have a significant edge, and we are happy to let that play out over time. We will check the system again at the beginning of January and make any changes as necessary. Until then, have a happy and healthy holiday season! Both the intermediate and long term trends in US stocks remain lower. As such, the Alpha Momentum Portfolio remains 100% invested in cash/equivalents. We will update the model once again on December 3rd. When the system determines that the trend of the S&P 500 is down on both time frames, we take a defensive stance and move the entire portfolio to cash. We move to cash in order to protect capital and avoid a deep and prolonged drawdown. What is the risk in moving the portfolio to cash? The risk is that the market quickly regains strength and continues higher without us. While our model shows that this can certainly happen (and often does), our model shows us that by taking the risk of missing out on some upside performance, we are increasing the likelihood that we avoid drawdowns of 30%+ like those seen in the early 2000s and during the Great Financial Crisis. This is a risk that we want to take. We will be selling out of all positions tomorrow at the open. When the system determines that the trend of the stock market is down on one time frame (but not both), like right now, we take a defensive stance and move half of the portfolio to cash. We move to cash in order to protect capital and avoid a deep and prolonged drawdown. What is the risk in moving such a significant portion of the portfolio to cash? The risk is that the market quickly regains strength and continues higher without us. While our model shows that this can certainly happen (and often does), our model shows us that by taking the risk of missing out on some upside performance, we are increasing the likelihood that we avoid drawdowns of 30%+ like those seen in the early 2000s and during the Great Financial Crisis. This is a risk that we want to take. We will be executing trades such that the model portfolio reflects the following composition as of close of trade tomorrow, October 12th. Equity markets have sold off aggressively over the past two days, and the S&P 500 is now 7% off the highs seen earlier this year. When the stock market sells off, and especially when moves lower are aggressive relative to volatility levels to which the market has been recently conditioned, it can be a scary time to be an investor. The stock market becomes a major focus of mainstream news, and it is hard NOT to look at your account values and worry. As systematic traders, we take solace in knowing that our process has been tested over several decades of market history and that our process has inbuilt methods to defend against large drawdowns. Drawdowns are a part of investing, and having a defined process helps us to make the optimal decision despite incomplete information (“the fog of war”). While the US equity market selloff continued into today, his comment remains valid. We design systems and processes to, amongst other things, protect us from ourselves. The rules have already been determined, now we just need to follow them. For more context on drawdowns and how they relate to systematic trading and investing, you can read an article that we wrote back during the March, 2018 drawdown in our portfolio HERE. Both the intermediate and long term trends of the S&P 500 are higher. As such, the portfolio will remain 100% invested, and we will be executing trades such that the model portfolio reflects the following composition as of close of trade tomorrow, October 2nd, 2018. Both the intermediate and long term trends of the S&P 500 are higher. As such, the portfolio will remain 100% invested, and we will be executing trades such that the model portfolio reflects the following composition as of close of trade tomorrow, September 18th, 2018. Both the intermediate and long term trends of the S&P 500 are higher. As such, the portfolio will remain 100% invested, and we will be executing trades such that the model portfolio reflects the following composition as of close of trade tomorrow, September 5th, 2018. Both the intermediate and long term trends of the S&P 500 are higher. As such, the portfolio will remain 100% invested, and we will be executing trades such that the model portfolio reflects the following composition as of close of trade tomorrow, August 15th, 2018. As per the Alpha Momentum Strategy, both the intermediate and long term trends of the S&P 500 are higher. As such, the portfolio will remain 100% invested, and we will be executing trades such that the model portfolio reflects the following composition as of close of trade tomorrow, August 2nd, 2018. Both the intermediate and long term trends of the S&P 500 are higher. As such, the portfolio will remain 100% invested, and we will be executing trades such that the model portfolio reflects the following composition as of close of trade tomorrow, July 17th, 2018. Both the intermediate and long term trends of the S&P 500 are higher. As such, the portfolio will remain 100% invested, and we will be executing trades such that the model portfolio reflects the following composition as of close of trade tomorrow, July 3rd, 2018.